This is a photo of Columbia University CORE member David Gilbert (center, on the microphone). 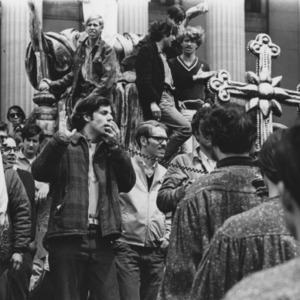 In the photo he is shown helping to lead the student rebellion that seized the campus of Columbia University in 1968. At the time, he was as a leader of the Students for a Democratic Society (SDS). He was among the SDS members that branched out to form the Weathermen which became the Weather Underground. He went underground when the group began a series of bombings to protest against the United States involvement in the Vietnam War. When he did resurface, it as was part of the 1981 Brink’s Robbery. The action was done in conjunction with former members of the Black Panther Party who had also gone underground to form the Black Liberation Army. During the action two police officers and a security guard were killed. Although he was not involved in the shooting and was to only drive the getaway car, Gilbert was sentenced to life and is still currently serving time. He was represented at his trial by Lynne Stewart, wife of Harlem CORE's Ralph Poynter. Love and Struggle: My Life in SDS, the Weather Underground and Beyond. “Photo of David Gilbert, Columbia University CORE,” corenyc.org, accessed April 22, 2019, http://corenyc.org/omeka/items/show/308.